Early childhood was spent in Massachusetts where he began his courtship with nature, enjoying the wooded landscape and nearby lake, it was natural to fall prey to the charm of the wilds. After moving to California the call of nature landscapes intrigued his imagination to see if he could portray the beauty that he saw in the mountains and desert to others. Denis employs his paint brush to bring to the viewer of his work that look of reality and vivid coloration that he so enjoys in his visits to the deserts of California and Arizona. He has been fortunate to achieve recognition for his efforts from different organizations such as ARTS FOR THE PARK, Best in Landscapes award 2006. Painting shown in two museums in Az. Tuscon Museum of Arts and Desert Caballeros Western Museum 2006. SAN DIMAS WESTERN ART SHOW silver medal winner 2005, LA QUINTA ARTS FESTIVAL award of merit 2005,SOUTHWEST ARTS FESTIVAL 1st place in oils 2003, 2002, 1999, 1998, 1993, 1992 & 1990. 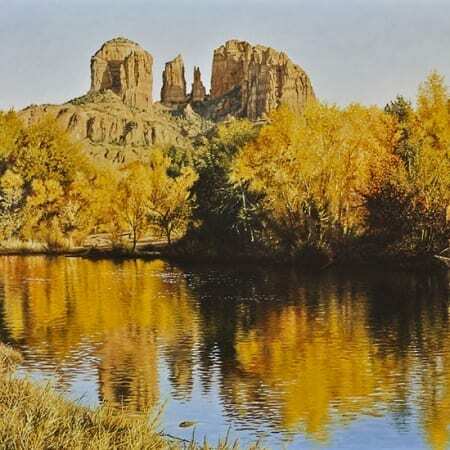 PHIPPENS ART SHOW in Arizona first place oils 1997, in 1993 best of show and 1st place, ST. GEORGE ART SHOW 1st place 2005, ST. PAUL’S WESTERN ART SHOW, chosen for the president’s choice award 1996. FALLBROOK REFLECTION OF NATURE ART SHOW, recipient of the 1st place award as well as being featured artist 1996, ARTS FOR THE PARK, winning the Franklin Mint Award in 1994. Winning regional award in 1993. He has been the recipient of the first place in popular vote at the DEATH VALLEY ART SHOW for many years. In 1998 he was chosen the recipient of the Sid Burns, Artists’ Artist Award. He is a participant in the EITELJORG MUSEUM ART SHOW.and the SETTLERS WEST American Miniature Show and Great American West Show. He is a participant in the Autry Masters of the American West Fine Art Exhibition. His works has been shown in the Small Works Great Wonders show in the National Cowboy Museum. He was a participate in the Trail Sides Masters in Mini-Jackson Hole Mni Show invitational. He is always learning, by plein air painting, reading and constantly looking at the sights around him. He resides again in a wooded terrain, surrounded by the abundance of nature’s beauty taking refuge in the sanctuary of a serene setting. Denis enjoys painting, and after a day of some other activity he is anxious to return to his easel. He is honored when his paintings are so well like that some one wants to place one in their residence, to allow one of his creations to become a focal point in their life.